The Player: Maybe not a household name, but a player that put together a pretty solid career, probably best know for hitting 32 home runs as a rookie with the Tigers in 1987, playing in his only All-Star game and being awarded the American League Silver Slugger at Catcher that year. Also played 5 years for the Yankees, catching Jim Abbott's no-hitter in 1993. 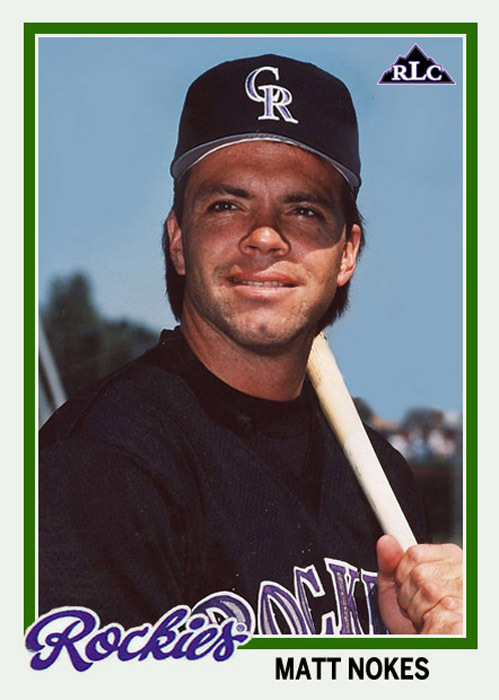 1995 would be his last year in the majors, starting with Baltimore and finishing with the Rockies, playing in 10 games with one start. The Card: 1978 Topps has been a set that I fought with for a while, never really figuring out the font. Eventually Topps would do the work for me with the "On Demand Inspired by '78" set, the first time the Rockies were using in this design. Every once in awhile I’ll come across one of his cards and think back to ‘87 or ‘88 and how he was one of the next big things. Cool card. 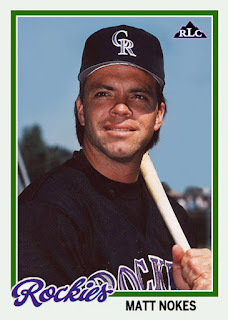 Definitely remember Nokes and that rookie season with the Tigers... but I don't remember him with the Rockies.